Here a monk, there a monk. Which one should you trust? Any tourist in China knows to be vigilant against the country’s voluminous counterfeits, from fake lamb meat to phony jade bangles. Now, the government is offering its help in sussing out fakes of a spiritual kind. Officials have begun certifying authentic Buddhist and Taoist temples to help distinguish them from their fake, profiteering cousins, the official news agency Xinhua reported on Thursday. 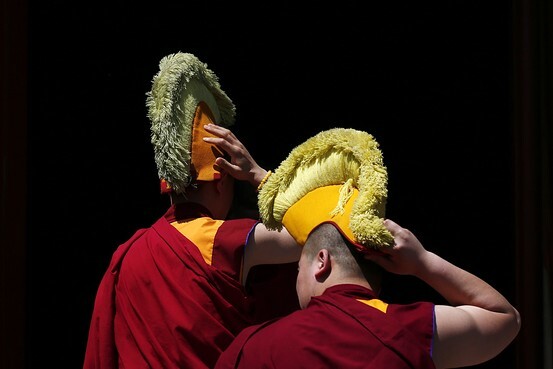 “There have been some non-religious sites employing fake monks who tricked tourists into donating money or buying expensive incense,” Liu Wei, a State Administration of Religious Affairs official, was quoted by the agency as saying. As part of the scam crackdown, the government will also make the names of legitimate temples available online for perusal by a leery public, Xinhua says. Though the phenomenon of fake monks is nothing new in China, outrage grew last year when one of the country’s four sacred Buddhist mountains, the mist-draped Wutaishan in Shanxi province, was found to have two temples in which fake monks were reportedly hired to trick tourists into forking over cash for expensive ceremonies and price-inflated incense. (Perhaps fittingly, one temple in question was dedicated to the God of Wealth). To be sure, plenty of legitimate tourist sites in China routinely charge high prices, including those with monks whose devotions seem genuine. In 2012, nearly half of such destinations in China had ticket prices in excess of 100 yuan, or about $16. Similar complaints have also surfaced in India and Japan.